Can the 1986 Ocean Grove victory over South End beachfront condominiums be duplicated in 2016 at the North End? The issue boils down to a more specific question: Is the Ocean Grove of 2016 a community of like-minded groups and individuals that would work together to block condo and commercial development at the North End? A Grover who lived here in 1986 tells us that the many voices who pushed back against the South End project contributed in a significant way to the failure of that plan. But he doubts that we have similar conditions now. 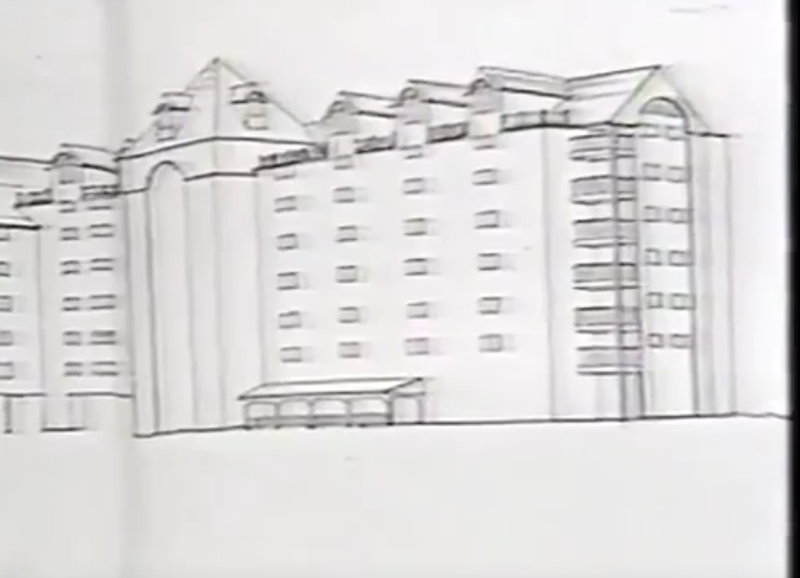 Concept drawing 1986 of South End condo project, 7 stories. What is clear from the videos and some personal conversations, is that a groundswell of opposition was heard in 1986 which contributed to the defeat of the project. and we are now left with the beautiful open natural area which can be seen today near Fletcher Lake and the beach. ———-CMA President Truitt admitted publicly that this South End plan was because the CMA needed money to pay for the beachfront expenses.. He said, “We are trying to merchandise the property.” The CMA recruited the Schneider group to find a way to make money through development. Truitt said that “residents are concerned with preserving the historical beauty of the Grove which may be threatened by condominiums.” But he liked the plan design. —–Ocean Grove Homeowners Association was represented by President Bill Benford. He said that the project is “totally unacceptable.” He voiced his concerns about density, bulkheads, storms, shadows and environmental issues. He said, “This structure is totally out of character for the rest of Ocean Grove.” Today the HOA stands in opposition to the citizens. —–Ocean Grovers come out in force. On January 28, 1987, over 200 OG residents met with the Board of Adjustment regarding their opposition to the project expressing concerns about the height, fire safety, congestion, blocking views and breezes, flooding, parking, foundation design and Victorian features. The next meeting was scheduled for February, but we don’t have those records. —– A group of citizens got together and pooled funds to pay a lawyer who showed up and pushed back on behalf of the Grove. —–HPC (BAR) turned down the preliminary design. Then, no final site plan was ever submitted. —–DEP claimed a “State riparian interest” because tidal water was involved. Fletcher Lake (aka Goose Pond) had, at one time, opened to the sea. The lawyer (Schneider”) said that this posed a major obstacle” and that he might have to sue the State. —–A Fire Department representative worried about a “disaster” in a building over 4 stories. —–A developer from North Jersey’s Schneider Group admitted that Ocean Grove already has a “very serious problem with congestion” in the summer, but he denied that this project would make things worse. Yet he was willing to speak publicly about the matter. He also spoke about his “option agreement” to buy the land from the CMA. He admitted that he needs DEP and Zoning and Board approvals. —– Architect for the project H. Robert Yaeger spoke out and defended the proposed sprawl along the South End Boardwalk, Fletcher Lake and Broadway. In the end, the South End project was never approved. CMA President Truitt also admitted in 1986 that they were planning a large building at the North End with over 200 units (4 times the size of the South End building). Some say that it was to be a nursing facility. He said that there would be a large increase in congestion. It was never built for reasons which are unknown to us, but the CMA was willing even then to overload the North End, and so what do you expect now from them? So, in conclusion, the Ocean Grove of 2016 is nothing like the activist community which existed in 1986. 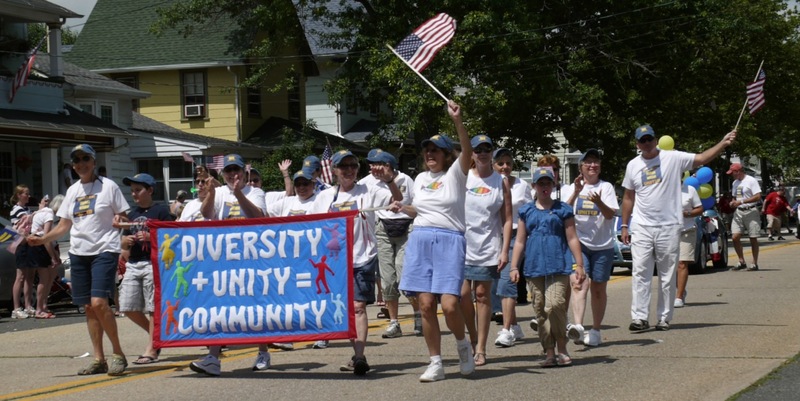 Too many citizens and organizations in the Grove in 2016 are apathetic as they pursue their own singular agendas, with little interest in the town’s history and future. The future of this town is endangered, and it looks like we have no cohesive community to stand at the barricades. If the NERP is built, the Grove will become a much different place. Do you want that? This post is about those people who spoke publicly about an important issue in town and whose voices helped block the project. But there is a huge other aspect which we will reiterate soon: In 1986 the South End condo project was a private plan proposed by private developers for private (?) land. They ran into trouble in dealing with zoning rules that did not allow such a plan in the historic and recreational zones. Variances would be necessary. But the current North End Redevelopment Plan (NERP) is a public project under the direction of the Neptune Township Committee by virtue of the fact that the CMA and WAVE were granted the Redevelopment Zone designation which lets them skirt zoning rules without going before the Board of Adjustment for variances. Today, the difference is, the NERP is a “PUBLIC PROJECT,” and the Government (Township Committee) acting on behalf of the property owner is the ‘Development Entity’. And now there are “bad guys,” and they are the Township Committee. Because Blogfinger has been shining a spotlight on the Township’s questionable authority over this “redevelopment process,” the entire project has become stuck in the mud and it will take a mighty big tow truck to pull it out. To their credit, the OGCMA never formally accepted a role in this process as a redeveloper. May it remain stuck in the mud. And die there. OGCMA please abandon this plan, and quit the b.s. story about the all tunnels underneath the lot. If they were truly a danger, one of those incredibly heavy pieces of construction equipment often parked there would of sunk into the ground years ago. Add some fresh gravel, charge $20 a vehicle Memorial Day thru Fall Flea Market day (w/e after Labor Day). The OGCMA will have a new source of revenue, and help the residential OG Parking issue at the same time.